The Q+ comes with a longer body, can be optioned with twin bunks and extra storage. Ideal for 2-5 people, and lovers of external cooking. The Quantum Plus is a 16ft, luxury camper that is ideal for couples and families wanting internal bunk options and a café dinette style seating with more internal space. Extremely versatile, it shares all the great features of the Quantum but has more internal space and more external awning space. The body adopts our new manufacturing technique of the fiberglass monocoque body. This updated body design increases strength and stiffness, reduces tare weight, only 1840 kg and guarantees dustproofing like no other trailer on the market. 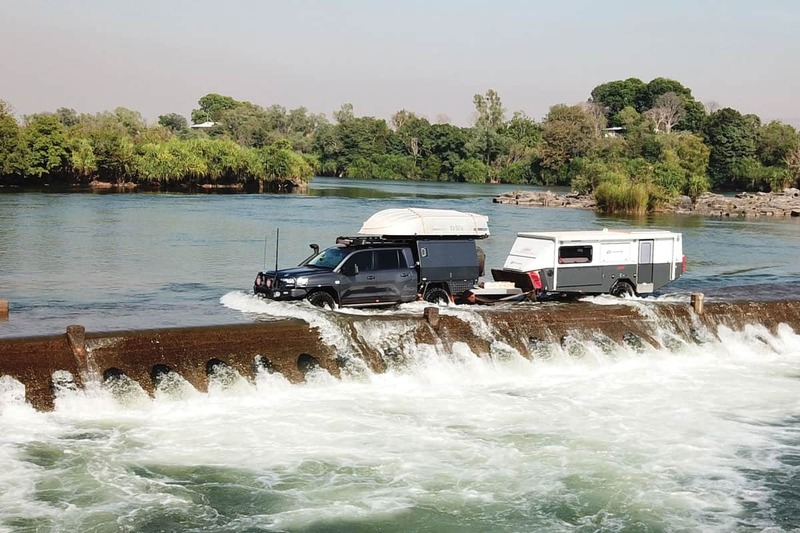 It has a narrow body width, just 1950mm wide for easy access to those remote camp spots and 4×4 tracks. Features a standard full-size queen bed with 3 optional bunk areas and internal ensuite with hot shower and marine macerator toilet system with 140 litre capacity, providing all the creature comforts of home in a stylish European décor with large water storage plus the benefits of an advanced solar system and AOR’s proven off-road technology. Enjoy endless sunrises and sunsets from the large opening and lockable windows at the café lounge/dinette which can be optioned with twin bunks and extra storage for the whole family. For the lovers of outside cooking, the Quantum Plus comes standard with full L-shaped stainless-steel external kitchen, generous pantry areas, 3 burner gas stove with glass top for extra bench space and a 82L fridge freezer. For many travelers, particularly families, the AOR Quantum Plus pop top opens a new dimension in remote area travel. The photos in this gallery display standard and option features of the Quantum Plus.